A mechanical seal is used to contain a fluid within a pump where a rotating shaft passes through the housing. Many are used in a wide variety of applications all over the world. Technical papers have been written about the various and sundry technologies and applications. But leaks continue to be the bane of anyone who needs to move fluid in their operations. Regardless of manufacturer, size and material of construction, the fundamental basics of the seal function remain constant. The heart of a seal is a combination of highly polished faces, one rotating and one stationary, that run in close semi-contact to each other. Damage to these faces causes seal leakage. Other leaks are caused by running dry, inadequate lubrication, misapplied equipment, operational issues and personnel issues. There are typically one or two of those “bad actors” where conventional sealing technology simply does not work well, where the seal-life expectancy is low and the cost for maintenance is high. There is a leak prevention systems (LPS) seal technology that, while not perfect for every pumping application, is a solution for those nagging bad actors. It is an advanced, patented, air-powered LPS seal technology. It works in pumps but also can be applied in other types of equipment such as mixers and blenders (both liquid and powder). The main feature of this technology is that the pumping process fluid is not in contact with the sealing surfaces and is not expected to lubricate the seal internally as is the case in most conventional mechanical seal systems. This design allows the system to actually run dry, to work in highly abrasive slurries and withstand gross axial and redial misalignment. This technology uses a static field of injectable sealant and a separate air flush internally to the seal. The injectable sealant fills the internal cavity of the seal, and a patented constant air-powered booster is used to maintain a continuative compression on the sealant. The LPS is maintained 24/7 where a reserve stock of sealant is located to feed the internal seal. Small losses of sealant occur, and the booster with an indicator rod will feed new sealant. Losses are minimal, and not internal to the process fluid, which makes this system applicable to food grade services. Replacement of sealant in the feed tube is easily accomplished while the pump is running. Image 2. How air is set up to seal and booster. 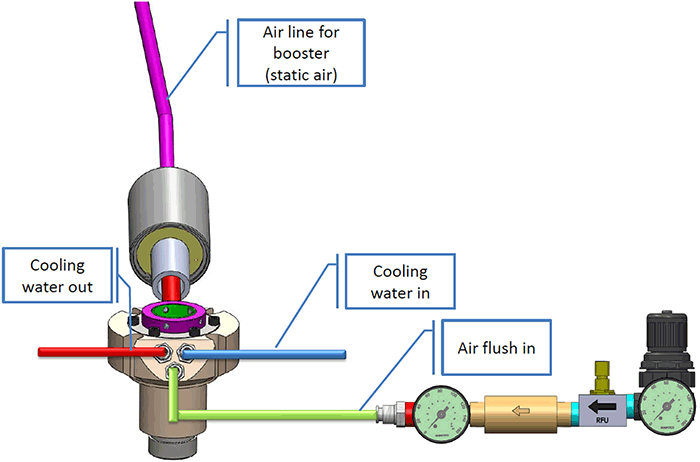 The air flush feature uses a small amount of compressed air—about 0.17 standard cubic feet per minute (scfm) at 8 pounds per square inch gauge (psig) for a 2-inch pump shaft—or nitrogen, which is injected into the seal to form an air bubble between the back of the seal (bottom of seal chamber) and the back side of the impeller. The air injection pressure is typically one bar—14.7 pounds per square inch (psi)—above seal chamber pressure. In some cases of high solids, a higher margin may be required due to the weight of the process fluid. 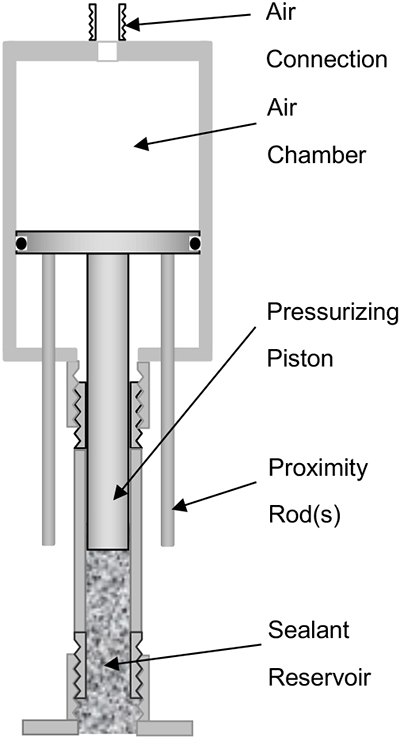 The process fluid cannot get past the air bubble to leak to the atmosphere. The pressurized flexible sealant maintains the air bubble but also acts as a constant available backup if the pump is shut down or the air is turned off. In essence, the complete LPS arrangement acts to maintain the air flush at the required pressure with minimum air consumption. When the air bubble is generated within the seal, there is a complete phase separation between the seal and process fluid. There is no contact between the process and the sealing components. By this, the seal is constantly sealing so it can withstand dry-run, closed suction and other upsets that would damage conventional mechanical seals permanently. The sealant will maintain seal ability for a short period if air is lost, or in some instances deadheading overcomes the air flush pressure. In some isolated cases, a leak can occur, but unlike a conventional mechanical seal, especially a double, permanent damage does not occur as it would with a conventional mechanical seal. With the LPS system, the seal can be corrected while the pump is in operation and returned to full operation. 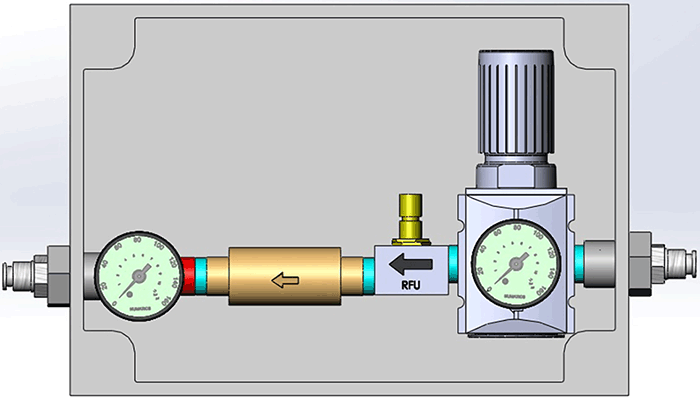 With a conventional seal, the pump normally would be shut down, pulled and the seal replaced, thus incurring the costs of an unplanned shutdown. Image 3. Leak prevention system pressurization assembly. The LPS seal does require external cooling of the sealant in pump applications due to the frictional heat generated by typical pump speeds (not generally required in mixer and slower speed units). This cooling is accomplished through an internal cooling jacket in the LPS seal. Cooling liquid does not come in contact with the process fluid. The entire air system for the LPS seal is maintained through an air control panel supplied with each seal. It would be similar in function as a barrier fluid support system for an API Plan 53 and double seal but using 100 percent air versus a barrier fluid and air pressure. It would be more similar to an API Plan 74 found on double gas seals. Each panel has a pressure regulator and needle valve that allows the user to adjust the required pressure and flow rate for the specific characteristics of the application. The booster does not consume air, only the air flush, which will be set based on box pressure and process fluid conditions.